Hi friends! 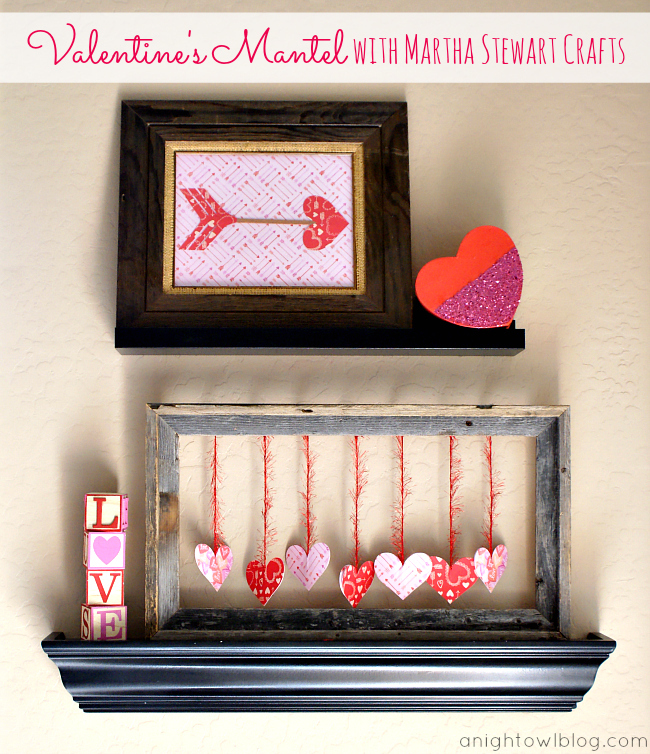 I have a fun Valentine’s Day Mantel to share with you today, created and updated with some fabulous new Martha Stewart Craft supplies! I’m part of a 12 month program this year where I get to show and share with you some amazing new Martha Stewart Crafts items, and starting out this month, it’s already so much fun! So let me show you what I used and how you can incorporate these wonderful products in your home! First up is this Glitter Dipped Heart. I purchased this heart box from the Target Dollar Spot last year, and this year I just wanted to add a little bling. Everything could use a little glitter, don’t you think? Draw a chalk line where you want the glitter to start with a straight edge. Go over the line with the glue pen and fill in the area below. Spread the glue around the bottom of the heart until area is covered. Add glitter, shake and let dry. 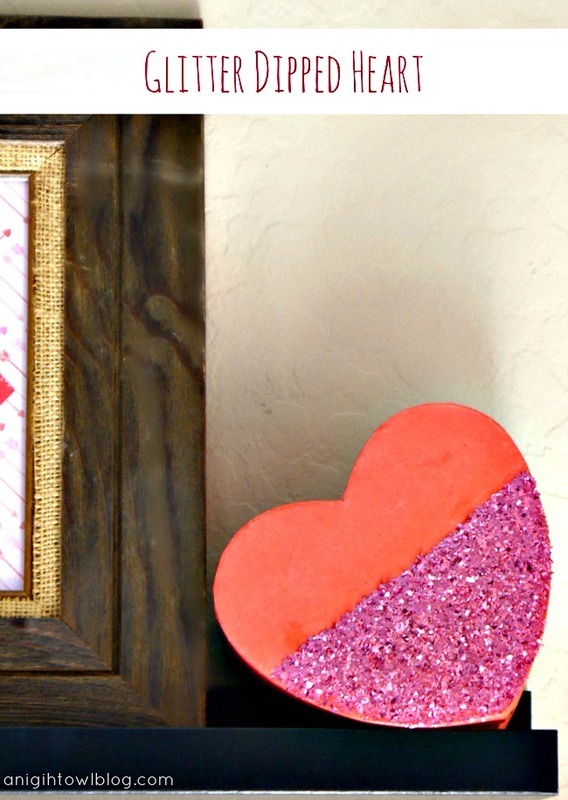 Next up is our Framed Heart Arrow. Paint the craft stick copper with the Martha Stewart Copper Guilding. Cut out a heart for the tip of the arrow and “feathers” for the end out of the Martha Stewart Valentines paper. Glue the heart and the feathers to the craft stick. 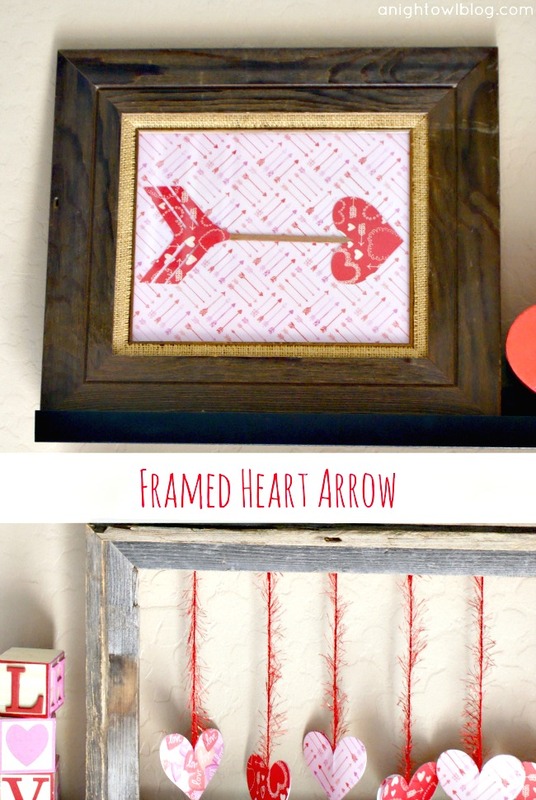 Frame arrow on Martha Stewart Valentines paper. And last, but not least, our Drop Heart Frame. I think this is my favorite! Cut hearts out of the Martha Stewart Valentines paper. Cut similar lengths of the Martha Stewart Crafts Glitter Eyelash. 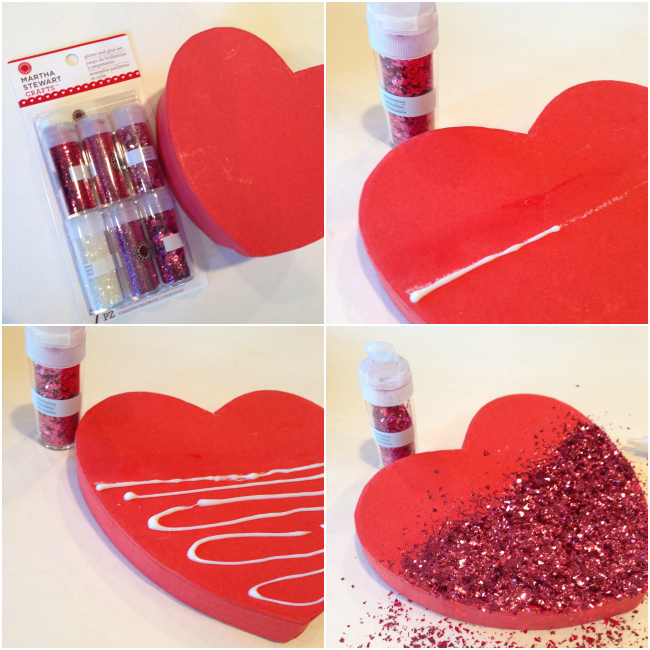 Glue the glitter eyelash between two paper hearts. Push the push pins into the back of the open frame. 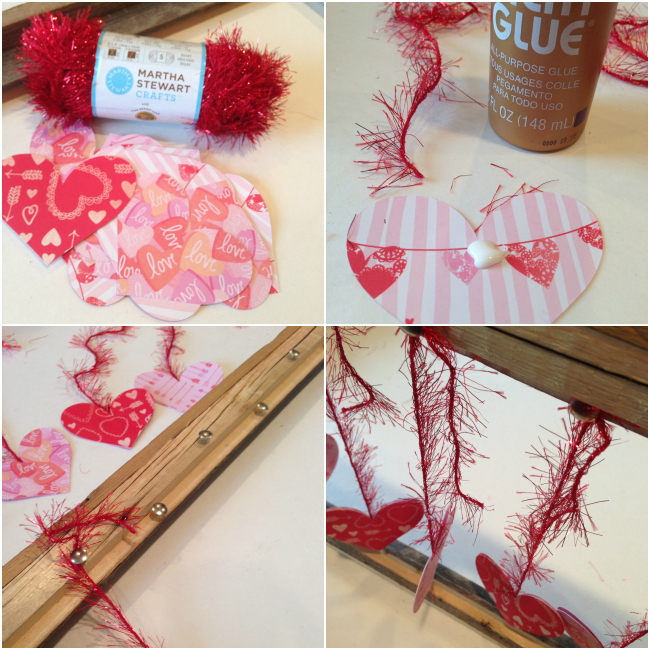 Tie the glitter eyelash to the push pins so that the hearts hang down inside the frame. What do you think? I think it’s simple, but oh so fun! 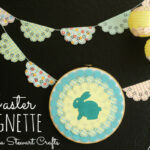 And I have to tell you that the Martha Stewart Crafts supplies were a blast to work with! I’m sure that’s no surprise there! I saw on Instagram one of the #12MonthsofMartha bloggers say that “Glitter Eyelash is the new black” and I couldn’t agree more! Such a fun product to work with. 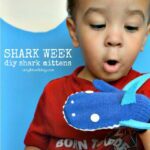 So get to Michaels Arts and Crafts, Jo-Anns Fabrics & Crafts or check out Amazon today to order your very own supply! What a lovely “hearty” Valentine surprise. Love it! I think the glitter dipped heart is my favorite. It’s simple, but just so gosh darn cute at the same time. I love them all! How fun to get to use Martha Stewart supplies!! Love the bling heart! Super cute! I love that its a mantel but not over a fireplace. Since we don’t have a fireplace some times it makes decorating for certain things difficult. Absolutely! We have no fireplace either so hung these shelves so we had something to decorate! I’m in love with the glitter dipped heart!! Thanks Angela! So easy, but fun! Very cute!! I love the mantle! A nice touch! 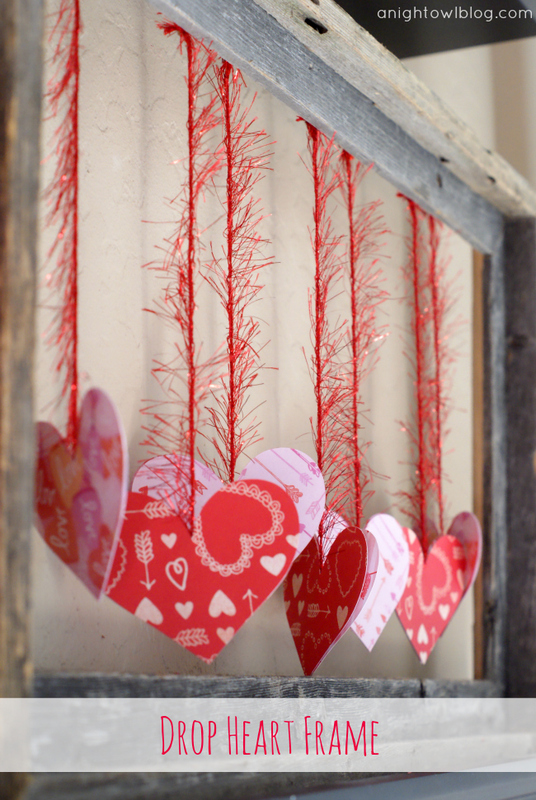 Wow, these are great Valentine’s decorations…beautiful and easy! My kind of projects! 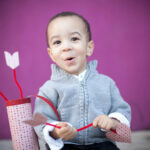 I’m hosting a loving valentine’s day party and I’d love for you to stop by! Wow – Everything looks so pretty! Love MS glitter, she makes the best craft stuff ever 🙂 Your hanging hearts are super cute! Adorable kimberly!! Featured you tonight at MOnday Funday! I saw that Bonnie – thank you!! LOVE IT KIM!!!!!! You did such a great job!!! Way to go!!! Your choice of yarn/string really adds some zest! You are welcome to link this post up or any other to the photo friday blog hop. Cheers and happy heart day!